Yep, "it's amazing" until someone gets mauled, and someone ALWAYS gets mauled. Wow.. just how stupid can one be? A mommy bear with cubs and they let her get this close??? This was just blind luck they survived at all. It's pretty obvious that that bear is comfortable around humans, otherwise they would have been ground meat long before she walked by. #2 And what is your proposed solution? Shoot the bear before it gets close? The bear chose to go that close. 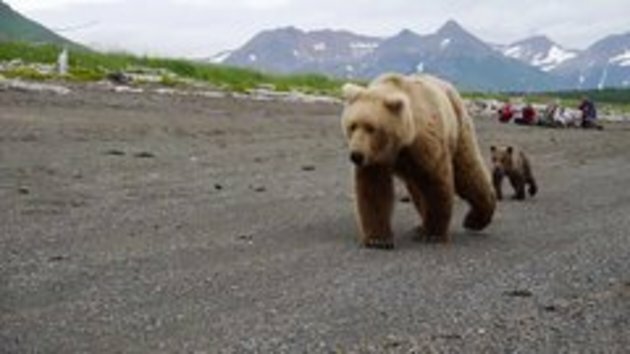 And as #3 pointed out, it's clear this bear is accustomed to humans, else she would never have taken her cubs so close to them. Never forget Grizzly Man....it only takes 1 bear to ruin EVERYBODIES party! #5 Or a wasp! I don't think I'll ever forget that, what a gorgeous woman and if I'm guessing her Mom, bet she was a looker in her time. Did anyone notice those bears wow! #7 So are you trying to start a game of 'What I watched two days ago?' Okay er let me see? Definitely the news I always watch the news and er Oh I remember now I watched this documentary about this guy who was caught shoplifting toy dolls from Walmart, he was 53 and liked to drink out of a trophy glass, his mug-shot was really strange he had a black eye, his left I think and really large dark sticky up eye brows, black hair a bit messy and he had a kind of gormless look on his face, kind of a sarcastic half smile and he looked like he needed more sleep. Someone had shot an arrow through his neck just below his ears and it was still there....did you watch it Burimi-ngton? #8 No I didn't watch that. The only reason why we should be worried about bears more than cows is the higher chance of attack when meeting one in wild. #9 Are you sure you didn't watch it Burimi-ngton, I think you did, in fact I'm sure you did. They only get this close when they have full belly's from a fish run. If this was the middle of nowhere, a mother would never bring her cubs that close to anyone with a pulse. #2 "Wow.. just how stupid can one be? A mommy bear with cubs and they let her get this close???" Yea everybody knows the smartest thing to do would be to scare her away by growling at her and waving your arms in the air.